Water gardening is popular because ponds and fountains can bring beauty, relaxation and wildlife to your backyard. But the more we bring in water plants for these features, the more risk we run of introducing invasive aquatic plants into local creeks and streams. Some of the aquatic plants commonly available online and through local nurseries and garden centers are known to be invasive. Examples include water hyacinth (Eichhornia crassipes) and Brazilian waterweed (Egeria densa). These plants may be sold without information that they can cause significant environmental and economic damage if they are released or escape into local waterways. Once established, these aggressive newcomers quickly overtake the water body. Removal can become extremely difficult and costly. 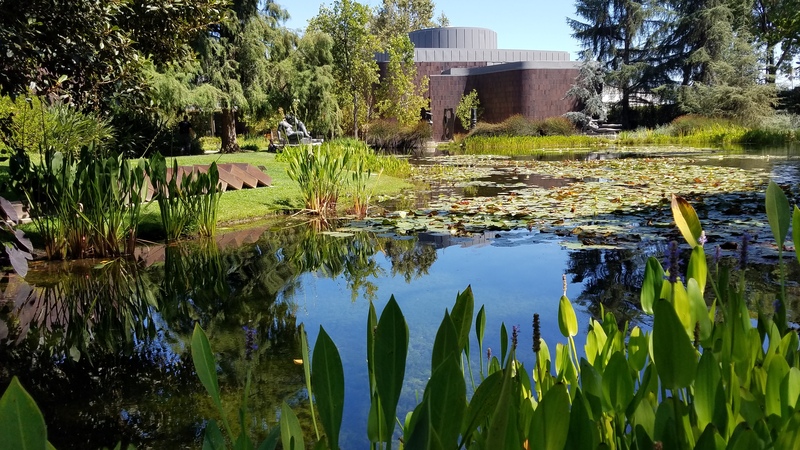 Instead, consider plants like the Pickerel weed (Pontederia cordata) and water lilies at the Norton Simon Museum in Pasadena, California. What Makes a Water Weed? While most garden plants do not cause problems, a small number are aggressive in new environments and can spread rapidly. The results can have dire consequences, especially in aquatic ecosystems. In California, more than $50 million has been spent trying to manage water hyacinth (Eichhornia crassipes) and Brazilian waterweed (Egeria densa) in the Sacramento-San Joaquin Delta alone over the last fifteen years. Nationwide, losses from invasive aquatic plants, many of which are the same species popular in the water gardening trade, total $110 million annually. You can help prevent these problems by following the easy steps above! Please visit Cal-IPC for a California guide to aquatic plants and how you can protect lakes, rivers, and other waterways in your area.